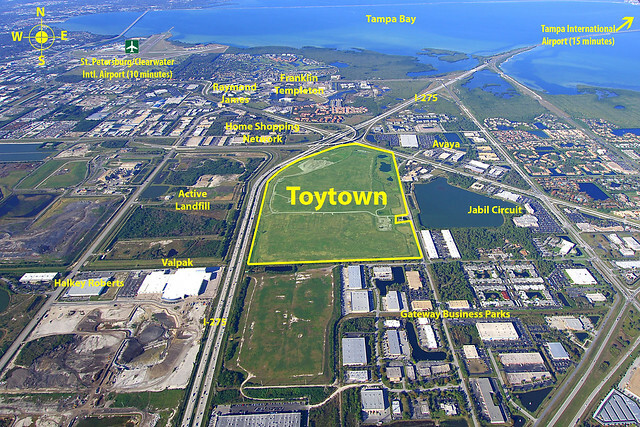 On July 1, 2015, Pinellas County issued a Request for Negotiations (RFN) for the sale or lease of the Toytown Site. Three responses were received by the September 1, 2015 3:00 p.m. deadline. Pursuant to Florida Statute, Section 119.071(1)(b)2, all submittals shall be subject to review as public records 30 days from opening, or earlier if an intended decision is reached before the 30-day period expires. Toytown is a 240-acre historic landfill in mid-county with excellent interstate access, making it a very attractive prospect for a mixed-use redevelopment plan that could incorporate office/industrial, retail, residential and recreational development.